“Candy, cigarettes, soda.” That’s what Den sells. Newspapers and magazines don’t figure into Den’s business in any significant way, and they haven’t for more than a decade. Den (who didn’t feel comfortable giving his last name) has been running a kiosk by Union Square for 20 years. Although he displays a handful of magazines, he says they’re mostly for show. “All the news is on the internet now,” he says. 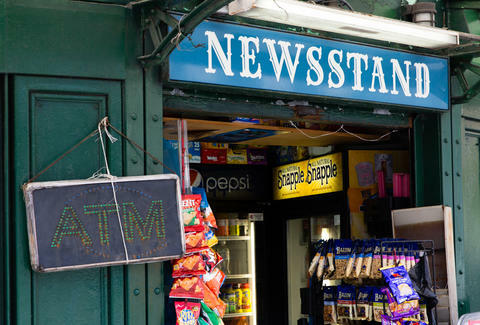 Once upon a time newsstands were an integral part of New York City life. The city was home to more than 1,500 independent newsstands at their peak in the 1950s; now the number is closer to 300. Most are in Manhattan, with a few scattered in the Bronx, Brooklyn, and Queens. These stands on street corners and in subway stops were once a convenient daily stop for New Yorkers looking for newspapers, glossy magazines, and maybe some Cheez-Its or a pack of cigarettes. For immigrants and veterans (particularly those returning from World War II and the Korean War) struggling to find full-time, salaried work, newsstands were an opportunity to start businesses of their own. These small but valuable pieces of real estate on New York City sidewalks were a symbol of entrepreneurship for those with limited access to capital -- but all that began to change in the early aughts. In 2005, the city, with strong support from then-mayor Michael Bloomberg, signed a contract with Cemusa, a Madrid-based design company, to construct the identical steel, aluminum, and frosted glass newsstands that now dot the NYC streetscape (Cemusa also built 3,300 bus shelters and 20 pay toilets). The old models, which Dan Biederman, president of The Bryant Park Organization and Biederman Redevelopment Ventures Corporation, refers to as “tawdry” and “put together with plywood,” were torn down. They were often ramshackle and idiosyncratic, varying based on the neighborhood and their owners’ sense of style. “The new design is definitely an upgrade,” Dan Biederman believes. Even so, they’re nondescript, uniform, and fairly soulless. Aesthetics is only one part of the equation. Newsstand operators used to pay the city a licensing fee, but owned their newsstands outright -- prices varied considerably based on location and condition. After the highly contested Cemusa takeover, the company took over full ownership of the stands. Operators now pay a one-time $30,000 fee to Cemusa plus a two-year city license fee of $1,076 -- they are renters, not owners. The revenue from the ads displayed on newsstands, once a significant source of income for the individual owner, now goes entirely to Cemusa. To make matters worse, the decline in newspaper sales in the early 2000s was a huge blow to the bottom line. “The margins for newspapers are dismal,” Biederman says, but customers who came for a paper would often pick up candy, cigarettes, and soda. “Everything is going down, down, down,” says another newsstand operator in Midtown East, who also didn’t want to give his name. “I’ve been here for twelve years, and every day is worse.” He cites the “big guys” (chain drug stores like Duane Reade and Walgreens) as his competitors. “This business will not be around for much longer,” he laments. Newsstands were supposed to be an entrepreneurial opportunity established by the city. But now, Biederman says, “there’s a black market, with all the money going to the people who illegally sell them out.” Since the Cemusa takeover, Biederman claims newsstand operators will often illegally pay the two-year fee to the city and rent to others to run, which may explain why none of the half dozen operators I talked to were comfortable giving their full names. Andrew Deitchman, CEO of New Stand, sees another future. He and his three co-founders have reimagined the modern newsstand by selling millennial-targeted items like Binchotan charcoal toothbrushes, Sir Richard’s all-natural condoms, and Closca collapsible bike helmets (and even magazines) via an app and bright, futuristic-looking shops in several major NYC subway stations including Union Square. 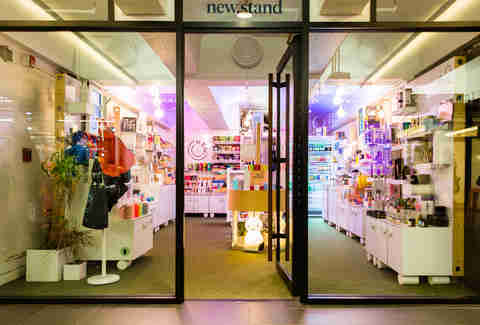 “The [old] newsstands were... pretty crappy -- we decided to do something about that,” Deitchman says, citing the quirky stores in Japan’s subways, where you can find stationery, hand-pulled noodles, and designer clothes, as inspiration for his business. He and his partners intend to integrate technology -- their free app offers a mix of article recommendations, deals on items for sale in New Stand locations, and even a playlist -- with modern New Yorkers’ daily routines. So far, it’s been a success: It’s grown from three locations to 23 in May, including locations in the new ferries coming to NYC's East River. 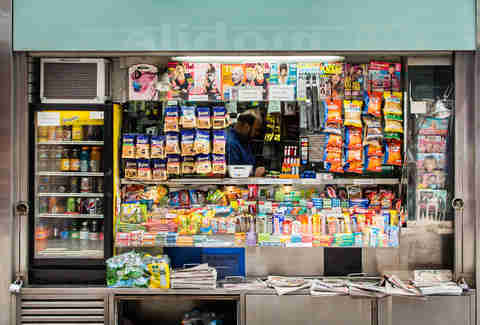 Deitchman sees a better newsstand as a way to improve commuter’s lives. “We can put a smile on someone’s face and help make their day a little easier... [Newsstands] are part of a routine,” he muses. For now, New Yorkers continue to shell out for snacks and water bottles... and even the occasional glossy. Perhaps the old newsstands’ days are numbered, or maybe they’ll find a way, against all odds, to survive. New Yorkers will always want concessions -- it’s just a matter of tailoring those concessions to their current needs.